Joseph Thomas's joyful new map of contemporary American children's verse combines serious linguistic play with intellectual pleasure. Poetry's Playground is an important, engagingly written contribution to the critical discussion of children's poetry as poetry. While the study of children’s poetry has always had a place in the realm of children’s literature, scholars have not typically considered it in relation to the larger scope of contemporary poetry. In this volume, Joseph T. Thomas, Jr., explores the "playground" of children’s poetry within the world of contemporary adult poetic discourse, bringing the complex social relations of play and games, cliques and fashions, and drama and humor in children’s poetry to light for the first time. Poetry’s Playground considers children’s poetry published in the United States from the mid–twentieth century onward, a time when many established adult poets began writing for young audiences. Through the work of major figures like Robert Frost, Gwendolyn Brooks, Carl Sandburg, Randall Jarrell, Theodore Roethke, Shel Silverstein, and Jack Prelutsky, Thomas explores children’s poems within the critical and historical conversations surrounding adult texts, arguing at the same time that children’s poetry is an oft-neglected but crucial part of the American poetic tradition. Canonical issues are central to Poetry’s Playground. The volume begins by tracing Robert Frost’s emergence as the United States’ official school poet, exploring the political and aesthetic dimensions of his canonization and considering which other poets were pushed aside as a result. The study also includes a look at eight major anthologies of children’s poems in the United States, offering a descriptive canon that will be invaluable to future scholarship. Additionally, Poetry’s Playground addresses poetry actually written and performed by children, exploring the connections between folk poetry produced both on playgrounds and in the classroom. Poetry’s Playground is a groundbreaking study that makes bold connections between children’s and adult poetry. This book will be of interest to poets, scholars of poetry and children’s literature, as well as students and teachers of literary history, cultural anthropology, and contemporary poetry. Joseph T. Thomas, Jr., is assistant professor of English at California State University. Dissolving borders based upon sternly held opinions is far from easy, but I believe that if it is at all possible to open minds through historically based, well-reasoned argument, Poetry's Playground has the means to accomplish this daunting task. The book includes generous notes to further elucidate certain points in the text. Joseph Thomas has created a comprehensive scholarly treatise that establishes the climate as well as the standard for further research into any aspect of children's poetry in the United States." 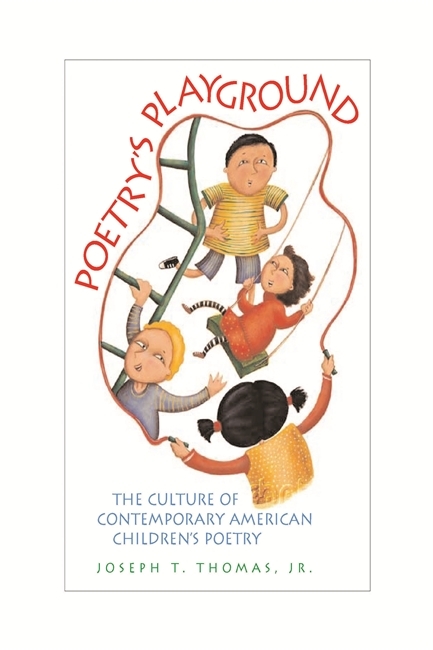 Joseph Thomas's Poetry's Playground places children's poetry in larger conversations-with canonical 'adult' poetry, with playground poetry-restoring it to its rightful place in American poetry. In a methodology that deftly mixes formalist criticism with rigorously contextual analysis, Thomas maps traditions of contemporary children's poetry, while examining the institutional forces that shape literary canons. Close-reading obscenity-laden schoolyard chants alongside acknowledged masters like Robert Frost and Randall Jarrell, Thomas practices what he preaches-he wants to show us the joy in taking all poetry seriously. Not only does Thomas do an excellent job of broaching the subject" but, in part of his book at least, he also does an excellent job of indeed discussing children's poetry in terms of both of its involvement with wider poetic, historical, and critical conversations, as well demonstrating the involvement of adult poetic, historical, and critical conversations in children's poetry. In doing so, Thomas not only has written one of the most interesting and thoughtful books on children's poetry that I have read in several years, but also one of the most interesting and thoughtful books on children's literature overall. The book ends with a series of helpful appendices listing inclusions in children's anthologies under various headings and categories, as well as children's poetry awards."